A shorter-more informal-probably nonsensical review. A rambling of my opinion as always. I will probably come back and edit this..
A sequel to Finding Nemo (2003), this film instead focuses on Dory, telling the tale of how the beloved blue-tang (voiced by Ellen DeGeneres) sets out to find her long-lost parents. Albert Brooks is back as Marlin as well as a number of famous voices; including Eugene Levy voicing Charlie (Dory’s father) and Diane Keaton (as Dory’s mother). At first, to be honest, I was worried about this film. As a fan of the original and not a great lover of sequels I was convinced that this would be disappointing not living up to its predecessor. Directed by Andrew Stanton and Co-directed by Angus MacLane it is aesthetically stunning. The development of animation is made clear throughout this feature, even showing how it has developed since FN. Pixar has succeeded again in producing a film with heart, beautiful visuals and comical moments. Differentiating itself from its original for the most part (apart from the occasional flashbacks to its predecessor), the film flawlessly introduces new characters, a new location whilst still retaining the original beloved characters. The plot is different, the visuals are as spectacular as the original and as always its fun to hear recognisable voices throughout the film. 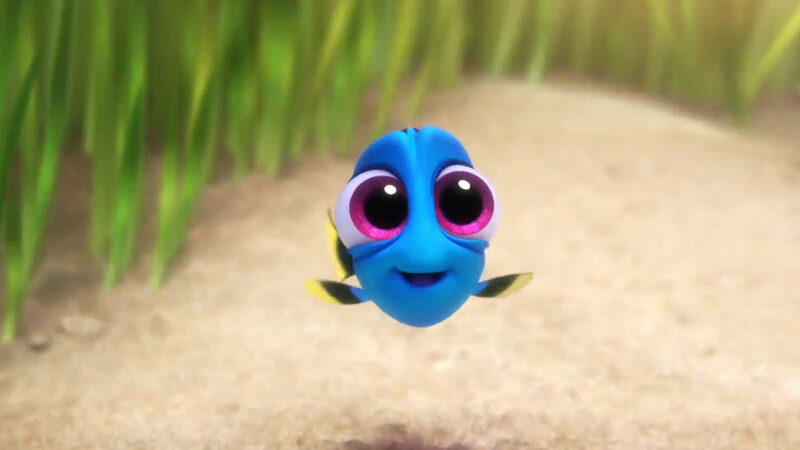 You feel for Dory with her memory loss, but I think this very personality trait is what makes this adventure that bit more exciting, plus baby dory is the cutest thing I think I’ve ever seen. (See GIF below). I’d definitely recommend this family friendly animation as it continues Pixar’s reign at the top of the animation pyramid.